We left Kansas City early Friday morning. Our team consisted of seven: Mark White- Team Leader, Bill Helbling, Dale Williamson, Duane Smith, Lori Brown, Jennifer Collier, and myself- Bryce Anderson. I sat with Lori every flight. J Shes pretty neat. We flew to Denver then to Los Angeles. We then geared up for the long flight. Sent my last few texts took my last few breaths of US air, and headed for the plane. By the grace of God I was able to check my guitar in at the gate or take it on most of the flights! The plane was quite fat. It held ten seats across with two aisles and went back some 66 rows. I sat with Lori again and was quite thankful to have a window seat. 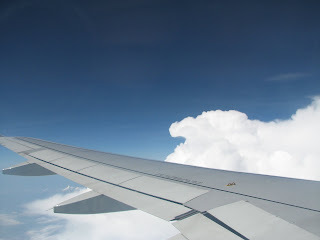 It took around 10 hours to get to Tokyo where we had a layover then on to Singapore which was another 5 or so hours. I don’t remember. Basically I feel like I step out of time, don’t know when I should be sleeping or not and even if I did I can’t always manage to do so. Meals, movies, and conversations helped to pass the time. We stayed in a hotel for several hours at the terminal in Singapore and finally made it to Kathmandu the next day. 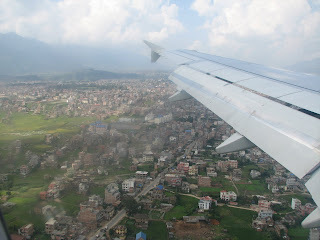 Flying into Nepal was pretty awesome- as in literally, I was full of awe. 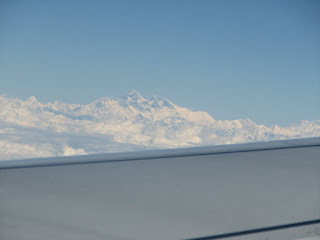 We saw the Himalayas, of which I was told one was Mount Everest but couldn’t quite tell which one it was (yes I know it was the tallest). 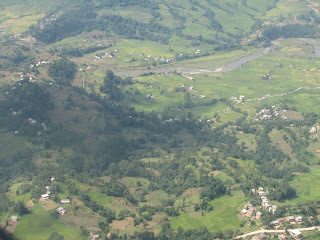 Also as we were flying down into Kathmandu, the valley was beautiful was sparse buildings along side beautiful rolling farm-patched hills and country side. We met with Brother Nepal and were constantly being asked for tips for guys wanting to talk our luggage for us. The van ride to the hotel was overwhelming. I was culturally slapped in the face. The poverty was extreme. Trash lined the streets, along with beggars and everyone trying to sell their products in little stores. Dogs lifelessly slept or hobbled down the road. The driving was chaotically controlled with traffic pulsating inches away and drivers methodically shimmying past other motorcycles or buses. Their crazed driving was normal and was never upsetting. Americans take it personally when someone violates a rule or expectation. Nepalese take it as it comes and just keep going. My nostrils filled with the mixture of rotting trash and automotive fumes, causing all senses to be challenged. We arrived at the hotel to meet again more men wanting tips to help move luggage. We settled in our rooms and then upon further conversation with Brother Nepal and Kishor, the two house dads at the orphanage, found out some very disappointing news.